What will 2018 bring for Thai politics ? In late 2017, clues began to emerge about how the National Council of Peace and Order (NCPO) would prepare its departure from power in 2018. A number of scenarios have been speculated upon, from leaving for good, to rigging an election, to postponing an election indefinitely. Prime Minister Prayuth Chan-ocha is fickle on this question. One moment, he insists that he hates being in power. In another moment, he threatens to rule the country forever. In another, he asks for public feedback on running in an election. Then came the NCPO Order 53/2560 (2017). Basically, this Order is an amendment-by-decree to the Organic Law on Political Parties, the provisions of which required new parties to register and existing parties to update their memberships with the Election Commission (EC) by 5 January 2018. The law’s mandate conflicts with the NCPO’s previous ban on all political activities. Through the Order, NCPO has refused to lift the ban, but has exercised its powers under Section 44 of the 2014 Interim Charter to extend the registration deadlines to the second quarter of 2018. However, the NCPO Order does more than just extend the deadline. It allows new parties to begin the registration process on 1 March, while existing parties—that is, the Democrat Party and the Pheu Thai Party—can only begin the process on 1 April. Moreover, the order terminates membership of existing parties. Members must register anew, so they are expected to lose up to millions of members. This membership reset, the NCPO claims, levels the playing field between old and new parties. Through the Order, the NCPO’s plan for 2018 has become clearer to the public : it signals that Prayuth will try to prolong his hold on power through constitutional means, competing in an election with a pro-junta party. Recently, the prime minister has travelled to several provinces. Photos of him with local politicians were leaked. Prayuth is likely forming his own party, using existing networks of local mafias and canvassers that he, three years ago, condemned as the root of Thailand’s dirty democracy. Another rumour is that the Ministry of Foreign Affairs has notified Thai embassies all over the world to prepare for an election in November, though the government refuses to confirm this. Will the plan work ? While the Thai military is good at staging coups d’etat, this “expertise” does not extend to planning exit strategies. Based on previous experience, various choices, with various consequences, await to be picked. In 2006, General Sonthi Boonyaratklin invited Privy Council member Surayuth Chulanonda to be prime minister. A little over a year later, a new constitution was complete, elections were scheduled, and the junta leaders returned peacefully to the barracks. But the relatively brief 2006 coup was criticised by many of its sympathisers as a waste, because it failed to annihilate the political power of Thaksin Shinawatra, whose proxies won the 2007 election. In 1991, a junta appointed a technocratic civilian government led by Ananda Punyarachun, which ran well until General Suchinda Kraprayoon lobbied political parties to “invite” him to be an “outsider”—that is, a non-MP—prime minister. This act sparked deadly riots, which permanently ended Suchinda’s political career and set the scene for Thailand’s political liberalisation over the following few years. The 2014 coup, as is typical, was well executed. Evidence suggests that it followed months, if not years, of planning. 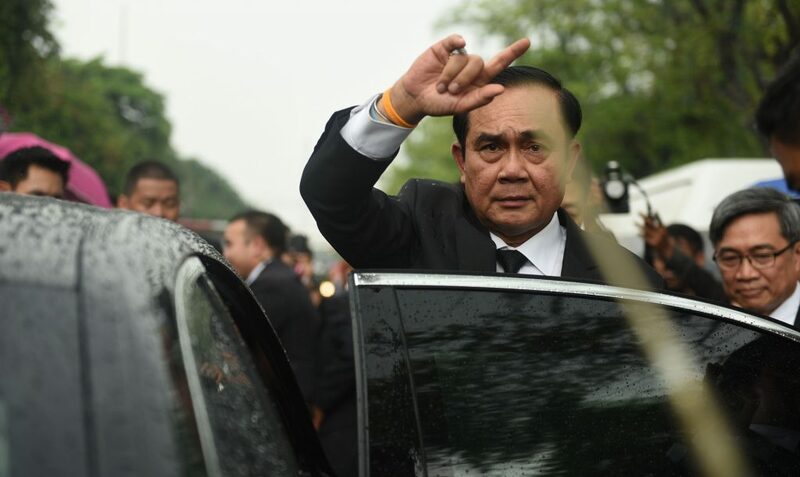 But like coup leaders before him, Prayuth now faces tough choices on his junta’s exit strategy. He must avoid sparking an uprising on the part of regime opponents, as well as avoiding having his coup being labelled a 2006-style “waste” by sympathisers. The NCPO is running out of excuses to remain in power. Some of the junta’s stated missions have been accomplished : the 2017 Constitution was drafted and approved in the 2016 Referendum, making it the ideal democratic charter according to the NCPO’s logic. Yingluck Shinawatra has been sentenced to jail and her assets have been confiscated. She has fled Thailand, and her brother Thaksin’s Pheu Thai Party is now in disarray. King Vajiralongkorn has smoothly ascended the throne, and the royal cremation for King Bhumibol went by with suitable majesty. Should the NCPO stay, it would do more harm than good, even judged on its own terms. Whatever jobs are left undone can’t be completed by Prayuth. Corruption is still rampant under junta rule, but Prayuth appears committed not to discipline any of his own men. Deputy Prime Minister Prawit Wongsuwan has been the subject of scorn on social media after he flew a chartered flight with his friends and a TV anchor to Hawaii. Prawit was more recently found to own luxurious watches worth millions of Baht—which he failed to declare in his asset report, and the origin of which he refused to clarify. This follows 2015’s notorious Rajakhabti Park procurement scandal, in which the then Army commander was implicated. On the economy, Prayuth’s Thailand 4.0 vision shows no signs of materialising. Without a concrete and sound economic plan, Thailand is heading into a “lost decade”. Competing an election with a proxy party is a risky choice for Prayuth. Proxy parties of past junta leaderships have failed in subsequent elections, and Prayuth’s prospects do not look any brighter. Both Pheu Thai and the Democrats have openly disparaged his plan and challenged the NCPO Order in the Constitutional Court. Civilian politicians have laid low for three years, hoping that an election would soon return ; now that the NCPO has revealed its true plan, obedience and patience are no longer virtues. Pheu Thai supporters, having been harassed constantly by the junta, see no reason to vote for Prayuth. He then has to compete with the Democrats for anti-Thaksin votes. In the election arena, the generals are amateurs compared with the parties’ campaign veterans. Of course, there is always a Plan B. This could amount to a “self-coup”, with the junta using its Section 44 powers to halt the application of the 2017 Constitution and call off an election. Alternatively, the NCPO may opt for an outsider prime minister option. Should no prime ministerial candidate receive an absolute majority approval from both the Senate and the House of Representatives in a post-election parliament, an outsider may be selected by a joint two-third vote. The first option, the “self-coup”, would just raise tensions further. The second choice, the outsider prime minister, is even more complicated and less promising than the proxy party plan. But Prayuth’s administration is one that operates at will. The prime minister himself serially makes mistakes, so it is possible that, under stress, he may choose the obviously “wrong” option with no sound explanation. But all is not lost : even if the NCPO has to leave the stage for a civilian government, its fingerprints are everywhere. The junta-appointed National Legislative Assembly promulgated a cyber security law that allows better surveillance of Thai citizens. The national 20-year plan will limit the next government’s choice of policies. The Internal Security Operation Centre, the Cold War-era intelligence agency, has been upgraded so it can monitor normal politics. Hundreds of people are locked up under charges of sedition, lese majeste, computer crime, and disobeying junta orders. Others have fled abroad. As the NCPO appoints its allies into the watchdog agencies, no remedy is expected for victims of its abuses even if the junta leaves office. Nor will there be investigation into any corruption under the junta. Most importantly, the 2017 Constitution has come into effect. Its overly complicated check-and-balance mechanisms set legal traps for the next government to fall into. After three years of stalemate, 2018 is probably a year of changes in Thai politics, for better or for worse. The status quo is not sustainable, and a more open power struggle will once again resume. Those who have been living with the fantasy of a peacefully apolitical Thai utopia must wake up the harsh reality that all the NCPO has done is to temporarily suppress Thailand’s political conflict—and worse, even deepen it with its unfairness and cruelty.